Blogged about In the Mix Music Festival 2017 // #raellaart // When you're an all around construction person. // #raellaart - Comfort Zone // Me at work (NAIA T3) // Plated mermaid tail brush set from Gamiss // I squealed when I saw a whole shelf filled with pandas at the store that I just have to take one home. 🐼 // Don't overthink. Listen to what your heart is telling you, even if everybody is against it. // Watched Ballet Philippines' The Nutcracker at CCP // Monsters (Bloom Arts Festival 2017) // #travelballetattitude at Harbour Square. // Sky Ranch photos // Christmas // Received a great gift yesterday because a closed deal means my God given talent will be put to the test again. I am grateful. =) // Feed Fixer (photo taken at Harbor Square // David's 27th Birthday // Spent time with my favorite human before the year ends! // Walking out of 2017 with a grateful and happy heart. This instagram round-up is pretty much late but hey hey hey! Guess what?! This December 2017 IG Round-up completes my monthly Instagram Round-up for the year 2017 and I can't believe that I completed this (though a bit late. haha). I will make a separate end-of-the-year blog post (probably after this post) so this is just about what happened during the month of December. I was actually very busy with all things that involve my future. I was working for Po-lite Technology Inc., and was busy preparing for our Christmas Party. Then I was working on my freelance work! I closed a freelance project so I was really grateful for that. Of course, social life shouldn't be sacrificed with all the responsibilities I carry. haha. I watched The Nutcracker with my friend. Ballet Philippines really did a great job! Speaking of, I need to do another separate blog post on that as well! We also celebrated David's 27th birthday and I was able to bond with my Archuleta friends after so many years! Since it's the season to be jolly, I met up with my friends too! Celebrated Christmas with my family -- both on my mom's side and dad's side of the family, the usual but very grateful about it all! Lastly, I spent time with my favorite human before the year ended! You've got some really cute pictures! I follow your blog, can you give me follow back? A lovely round up, great photos. I'm glad you had a lovely December. Your photos are beautiful! The quote says better late than never :) January is still a good time to share December posts! So good you spent time with your favorite huma being :) That sounded like a real gift and being happy and grateful is always so good for our souls! Hope you have a very nice week and a great rest of January! 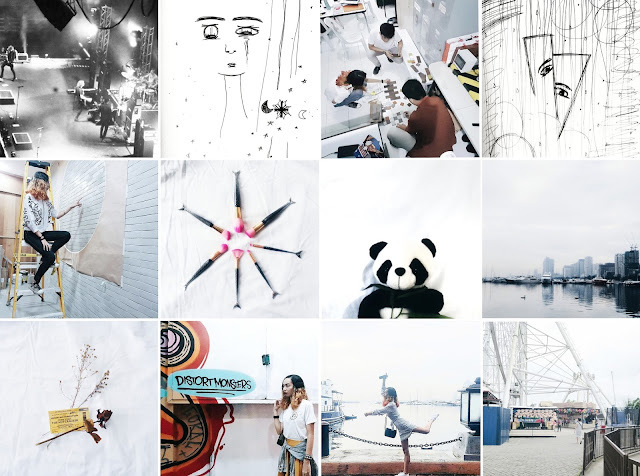 Love the white palette of your IG favourites. Nice to know you had fun December, hope your 2018 will be even better. Love these! All your photos are so creative. Loving the cool vibes! you have an amazing instagram account! It looks like you had a nice December! So in love with this post! Your instagram looks so pretty! Loving the black&white and the contrast in your images!